"David Munrow did not just emerge into the field of medieval and renaissance music......he exploded into it. He established a standard that can now never be ignored, and the stimulating shock-waves from his explosion will carry far into the future..." Sir Anthony Lewis, 1976. This is a tribute blog to a renowned broadcaster and musician. It consists of relevant articles from the internet plus some original, and formerly unpublished material. MORLEY. Dances for Broken Consort*. SUSATO. 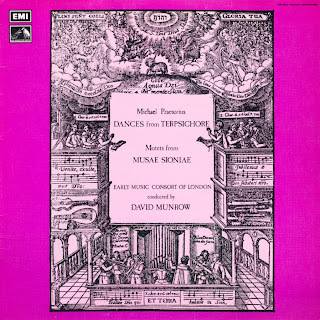 The Danserye—Twelve Dancest *Morley Consort, t Early Music Consort of London both conducted by David Munrow. HMV HQS1249 (LI 60). Dances Joe Broken Consort: Mounsier&apos;s Almaine (Byrd); Lachrimae Pavan (Dowland); Michill&apos;s Galliard (Anonymous); Lute Duet—My Lord Chamberlain&apos;s Galliard (Dowland); The Jew&apos;s Dance (R. Nicholson); Captain Piper&apos;s Pavan and Galliard (Dowland); My Lord of Oxenford&apos;s Maske (Byrd); Lavolto (Morley); La Coranto (Morley). Robert Searle was educated in Windsor at the Royal Free, the Tutorials, and East Berkshire College. He is the originator of two major "work in progress" Paradigms known as Transfinancial Economics (TFE), and Multi-Dimensional Science (MDS).The former believes that new unearned money could be electronically created without serious inflation notably for key environmental, and socially ethical projects. Multi-Dimensional Science though presents an unique "scientific" Methodology by which claimed psychic, and spiritual "phenomena"could possibly be "proved". Apart from the above, Searle has proposed the development of the Universal Debating Project, a structured interactive "encyclopedia" of virtually "all" pro, and con arguments for practically any subject in the world.He is the creator too of a tribute blog on the musician, and broadcaster David Munrow (1942-1976), and a pioneering one on Contemporary Early Music.Furthermore, he has a very large audio-visual collection of Medieval, and Renaissance Music (manually created as Searle8), and has an "unusual" musical project notably involving improvisation that could open up a "new" approach to music. Examining An Earlier "Pied Piper". A Sagbutt, a Minnikin, and a Flemish Clackett!! Contemporaries of David Munrow Remember.